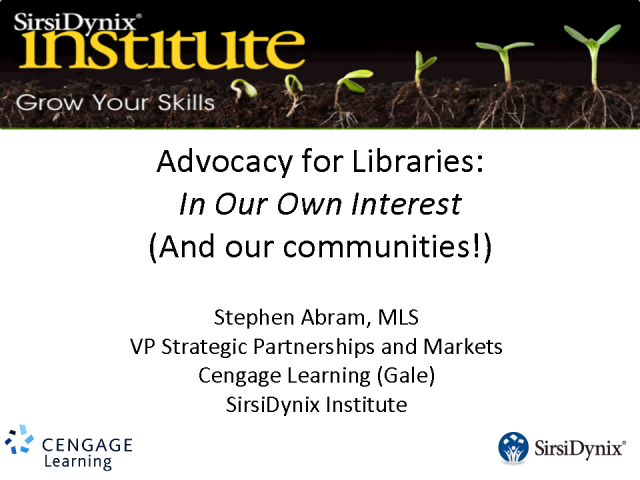 As promised at the event on Capitol Hill in D.C. at ALA Annual 2010, SirsiDynix and Gale Cengage Learning present a webinar on advocating for libraries. Advocacy has two main goals - to promote the library and to gain support, funding and endorsement of libraries' roles in our communities and society. Stephen Abram has been involved in both internationally for his entire career. This session will explore both tried and true methods as well as some of the emerging strategies that are gaining traction. As the world of information and technology changes rapidly, it is even more critical that libraryland positions itself well for the future. Libraries matter. Stephen Abram, MLS, is past-president 2008 of SLA and the past-president of the Canadian Library Association and Ontario Library Association. He currently serves as vice president for strategic partnerships and markets for Gale Cengage. Prior to Gale, he was vice president for innovation for SirsiDynix and chief strategist for the SirsiDynix Institute. He was electronic information publisher at Thomson after managing several libraries. Stephen was listed by Library Journal as one of the top 50 people influencing the future of libraries. He has received numerous honours including the 2009 Roger Summit Award, and speaks regularly internationally. His columns appear in Information Outlook, Multimedia & Internet@Schools and OneSource. He is the author of ALA Editions' bestselling Out Front with Stephen Abram and contributed to ALA's 2010 Boomers and Beyond. His blog, Stephen's Lighthouse, is a popular blog in the library sector. In a SirsiDynix Institute event celebrating National Library Week, join American Library Association President-Elect Roberta Stevens for ALA's annual report on the state of America's libraries. Ms. Stevens, who presently serves as outreach projects and partnerships officer at the Library of Congress and as project manager of the National Book Festival, has spent more than 35 years in librarianship. Register now for this unique opportunity to hear from the next president of the ALA as she details the latest trends, challenges and triumphs of libraries in America. If any type of library wants to understand its patrons’ information behaviors and preferences, how its community views library services, or where there are potential partnerships within the community environment, it should consider using focus groups. “Guided group conversations” offer libraries an incredible wealth of information about their clients, their services, and their evolving environment. This talk discusses the design of effective focus groups, from identifying participants to developing insightful questions and prompters, facilitating the group dynamics and dialogue, ways to use online environments, personas, and other techniques to get­ and keep ­a meaningful and directed discussion going and on topic. Information mined from focus groups and online conversations are critical in planning services, changes, and any library's future. Now more than ever we are challenged with providing information services with dwindling budgets and time. Join us as Richard Hulser presents information on how to initiate and strengthen partnerships with vendors and content services providers and optimize use of their products and services in your organization. We'll talk about how to determine what makes a good vendor partnership for you, and best practices to take the negative out of negotiations with some examples and scenarios that can make the negotiation process productive and fun. As libraries continue to evolve to meet customers' needs in a rapidly changing culture, the concern over the future of print and the "book" remains core to their existence. However, in looking at current trends, there is evidence to suggest otherwise. The future of libraries may not be dependent on the creation or evolution of new service delivery models based upon the book, it may actually reside in something more "deeply local." Join Helene Blowers in a lively conversation about "new life" opportunities for libraries. As old formats and service models decline, there's a new phoenix rising from the shadows. Librarians are increasingly under pressure to step up their marketing efforts but where to begin when there's no plan, no time, no staff and no money? Is it possible to create a marketing plan when your organization has an outdated or nonexistent strategic plan? You betcha! There are many news tools available for marketing. Create effective strategies and avoid the "Shiny Object Syndrome" by learning how to determine which web 2.0 tools are best for your library. Join Nancy Dowd as she shares tips on working with the new marketing mix to find the right combination for your library. She will discuss the newest trends in marketing including mobile marketing, word of mouth marketing strategies, Twitter, Facebook, blogging and Podcasting. The SirsiDynix Institute supports librarianship and professional development with free, ongoing events and speakers on topics relevant to you and your library.